AutoDriverClub.com provide application services for the US residents and citizens, so you can fillout application on our web site and we will send all necessary information to AAA office where your International Driving Permit will be issued and sent for you. Also we have expedited service that can help you to get International Driving Permit in two work days! IDP info. On September 19, 1949, the United Nations Organization has ratified an International Driving Permit to give the chance to people to use vehicles in the different countries and not to have problems with police officialdom. Today, an International Driving Permits with National driving permit allow their holders to drive in countries which have signed the Geneva (1949) and Vienna (1968) Conventions on Road Traffic. Countries which haven't signed the Conventions on Road Traffic also can recognize an International Driving Permit valid and accept it in their territories. Only an International Driving Permit" can give you possibility to drive in many countries of the world. 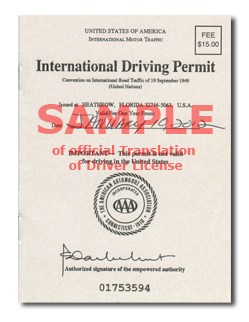 You have to have an International Driving Permit when you travel outside of your home land. If you are going to go to foreign country and planning to use a car, first of all, figure out whether your National Driving Permit will be valid there. Please, read Driving Overseas for additional information.